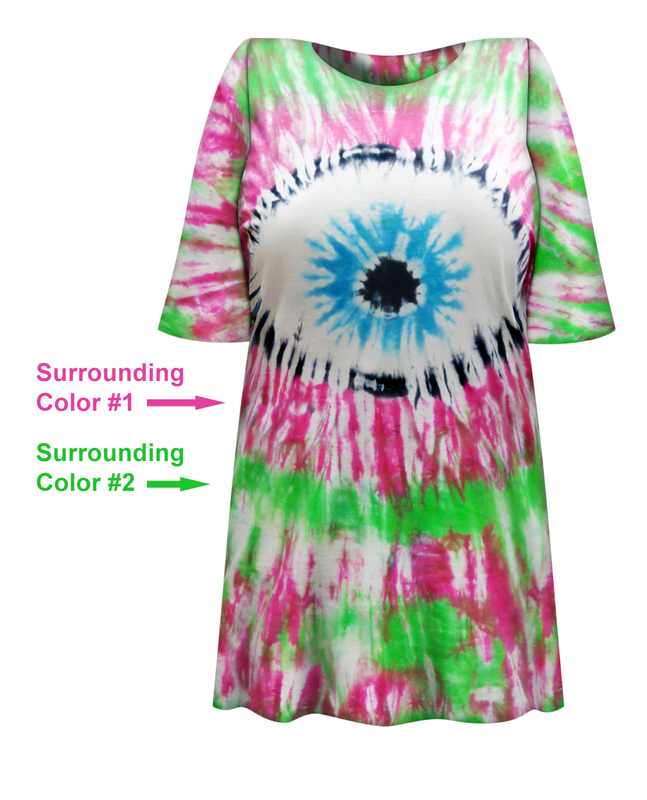 Eye Plus Size Tie Dye T-Shirts. Eye design is on the front & back of shirt. These are handcrafted tie dye plus size T-Shirts. Each shirt will be unique and different, no two are ever the same! They are all 100% cotton (except as noted on the 5xl/b below), short sleeve, round (crew) neck, straight cut unisex t-shirts. The T-Shirts themselves are imported, but are dyed in the USA. Machine washable. 4XL/a: Champion Brand; They measure appx chest:58 hips:58 length:32, and there is a small C emblem on the sleeve. 5XL/a: Dryblend Brand; chest:68 hips:68 length:36, the colors are very pretty, but dont come out quite as bright.